The extreme weather that began in June (see Deanna Pan’s MoJo coverage here) has rolled over into July. 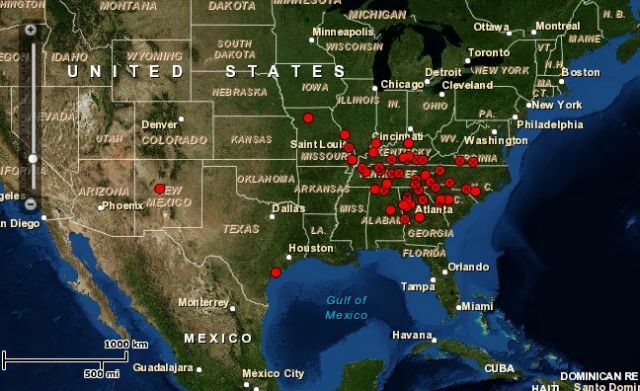 Yesterday—only the first day of the month—was brutal enough to shatter 27 records and tie 24 records for the highest ever July temperatures (map below). More amazingly, the first day of the month also broke 6 and tied 11 records for the highest ever recorded temperatures on any date at sites in Georgia (Rome: 108°F), Kentucky (Barren River Lake: 108°F), North Carolina (Tapoco: 106°F), and South Carolina (Grnvl Spart Intl Ap: 107°F). As you can see in the map above, 72 percent of the lower 48 is now classified as experiencing dry or drought conditions. And don’t expect things to get better soon. 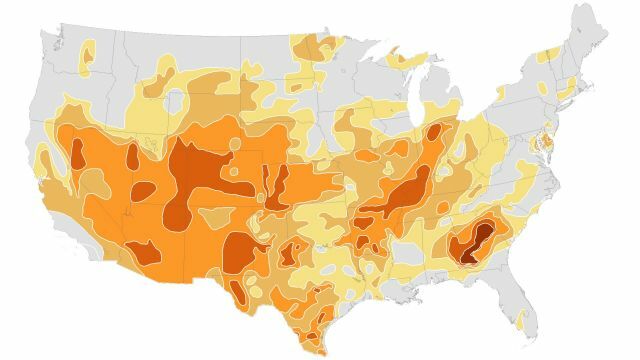 July to September temperature and precipitation predictions (click for larger version): NASA | Climate Prediction CenterNOAA’s Climate Prediction Center’s drought monitor (above) shows drought, plus anomalously high temperatures, persisting for the next three months. Only the Pacific Northwest is expected to harbor below normal temperatures. Seattle, expect a tourist boom. 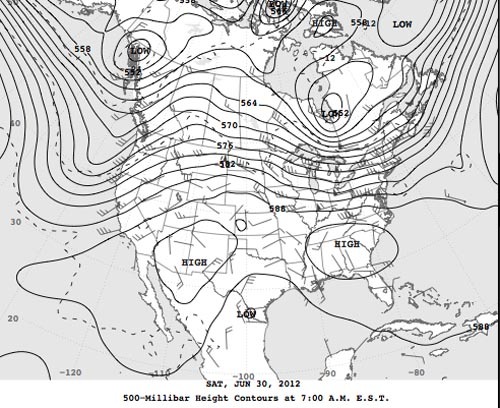 500 mb chart for 0700 30 June 2012: NOAA The good news is that the high-pressure ridge that brought so much misery to the eastern US is slowly sliding westward. The bad news is that another one is building behind it in the Southwest. Making matters worse, the extremely high temperatures in the East are abetted by extremely high humidities. Aberdeen, Mississippi suffered 104°F temperatures yesterday. 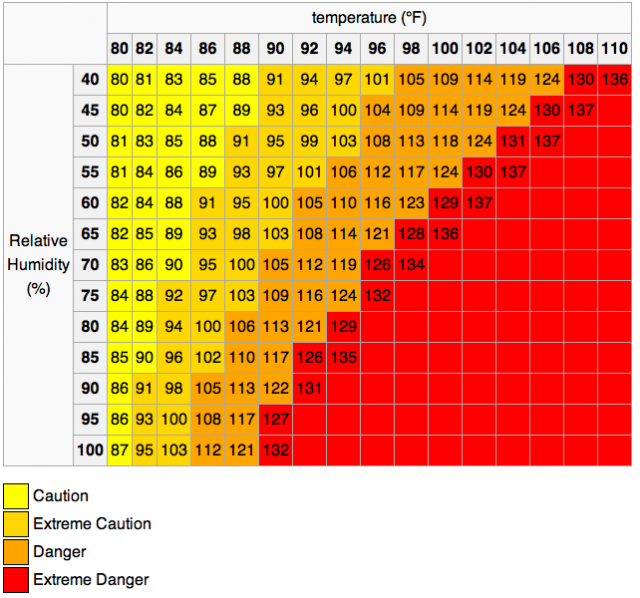 But its dewpoint of 84° at 3 pm made for a heat index (air temp + relative humidity) of a paralyzing 136. 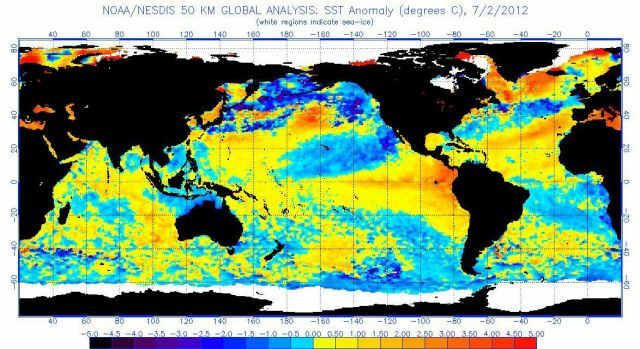 As you can see in this map of global sea surface temperature anomalies, the ocean is considerably warmer than average in most of the Gulf of Mexico, and scarily above average off the Eastern Seaboard. That’s like gasoline to the flames of humidity. 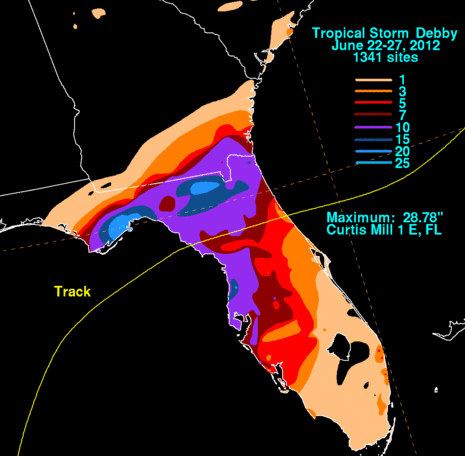 Tropical Storm Debby rainfall totals: NOAAThe only force that’s likely to cool off US waters off anytime soon is a tropical cyclone. The waters around Florida are currently cooler than average (see sea surface temps map, above) thanks to the devastation of Tropical Storm Debby last week. 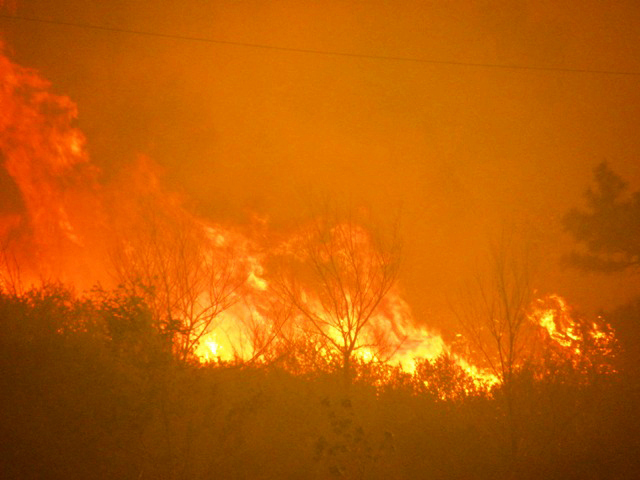 Fire and brimstone? Or flood and havoc? Doesn’t seem to be a whole lot of comfortable middle ground anywhere these days.